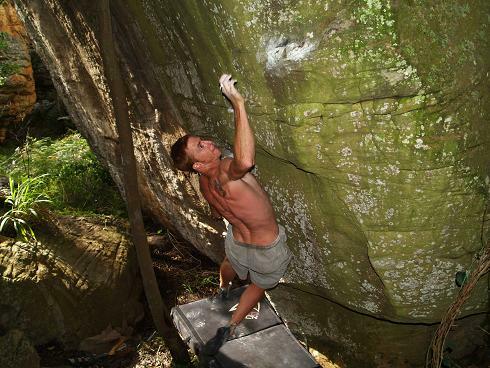 The boulders of Gold Rush in Mpumalanga saw more action this month. The highlights were Guy Hubbard's first ascent of the dynamic "Leap of Faith" 7C, and Russ Hattingh repeat of "Blunt Force Trauma" 7C. Hubbard also opened a range of moderate problems including "Absinthe" 7A, "Loco" 7A, "Lime & Soda" 6C and "Mail Order Bride" 6C. Check out the gallery here. Guy mid-flight on "Leap of Faith"